We made it to Nova Scotia on our cross Canada road trip. We had done Cape Breton and we got rained out at our campsite outside of Halifax but the rain held back for us to visit Peggy's Cove before going to the city to get some lunch. Peggy's Cove is one of the must-see tourist spots in the Halifax area. Why do people like it so much? It looks great and you will get lots of nice coastal pictures of the lighthouse and the rocks. We were worried about getting parking but there was a ton of parking at the gigantic gift shop nearby the lighthouse so we had very little trouble. The parking was free! We were surprised and half expected to pay Niagara Falls level amounts for parking. There were quite a few people walking around on the rocks but it is a huge area. It was foggy but at least it wasn't raining. Seeing Peggy's Cove in the rain wouldn't have been as nice. Stay off the damn black rocks people. They are wet and slippery. We saw these signs all over. Our friends in Nova Scotia told us to stay off the black rocks too since people can get hurt or slip and fall in the ocean. You don't want to fall in the ocean as it is freezing cold. We got plenty of pictures of these cool rocks. Someone was nice enough to take our picture at Peggy's Cove. We sat down on the rocks and watched the waves crashing for a while. We saw someone walking out on the black rocks despite all the signs warning against it. He fell pretty hard on the ground since the rocks are super slippery. The fall looked like it hurt quite a bit but he walked it off pretty casual. I think he was completely horizontal at one point in the fall and he landed on his side. Thankfully, he made his way back to safety. It all happened so quickly. We were relieved because we really didn't feel like watching someone die at Peggy's Cove. There were boats going past. It looks like you can take some tours on the boats. There are some cool houses and shops near Peggy's Cove. There are rules about what buildings they can build and who can live in the area in order to keep Peggy's Cove a small town like it is. The idea is to preserve the small town quaintness of the place. There seemed to be dozens of artists with their canvases out doing some painting of the cove to sell. We would highly recommend checking out Peggy's Cove. It's a nice place to see and it felt relaxing to be on the rocks and look at the ocean. Well, aside from watching the guy tempt fate on the black rocks it was relaxing. We decided to drive to Halifax for lunch since they have a bunch of vegan options there. We weren't sure exactly where we wanted to try yet but we had the drive to think about it. 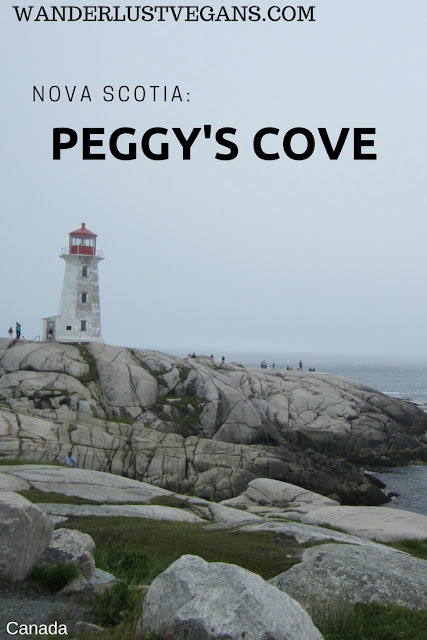 If you enjoyed reading about Peggy's Cove then you will like reading about the rest of our time in Nova Scotia and our Cross Canada road trip for Canada 150. What better time to see Canada than Canada 150, to explore the cities and national parks across the world's second-largest land mass.